How Dental Implants Become Fixed in The Jawbone? Dental implants are one of modern dentistry’s greatest innovations, an ideal restorative treatment for patients with damaged or missing teeth. Since they first started being used in the 1970s, dental implants have been used to restore the smiles of thousands in the UK and across the globe. But what makes dental implants stay firmly fixed and in place in the mouth? 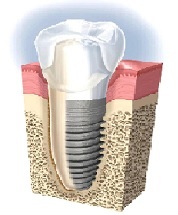 The answer is through osseointegration, or the process in which dental implants integrate themselves with the jawbone. Dental implants are made of titanium. As a biocompatible material type, titanium is recognized by the body’s bone cells and blood cells as being “part” of the body itself. This allows the dental implant to function as if it were a natural tooth- when they are healthy, natural teeth are held in place and supported by the jawbone surrounding them. When a patient loses a tooth, however, the jawbone begins to deteriorate over time. When a dental implant is inserted into the jawbone, the jawbone begins to rebuild around the dental implant and support it like it did the natural tooth. What role this plays in a dental implant procedure is quite simple to understand. The first stage of a dental implant treatment involves the placement of titanium screws into implant sockets in the jawbone. These are used to replace the roots of the missing teeth in the jawbone. Afterward, temporary teeth are then fitted on top of the titanium screws to serve as provisional teeth whilst soft tissue and the jawbone recover from the first stage of treatment. During this time, the bone around the regions where the dental implants were placed slowly starts growing around the anchored implants, firmly settling them in place– osseointegration. The process of osseointegration itself consists of three steps that typically take around 20-24 weeks to complete, also the time between which the provisional teeth are first placed and then permanent teeth are later loaded. When examined from a biological standpoint, osseointegration highlights the wonders of modern dentistry working together with the marvels of the human body for effective, innovative dental patient care. As a process, osseointegration occurs in three steps. 1) When osseointegration begins, platelets slowly begin to form on the surface of the titanium screw. 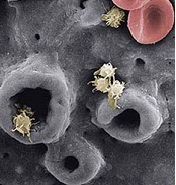 The platelets continue to cover more of the titanium surface over time. 2) Eventually the platelets come together to form a fibrin matrix that binds the platelets together. The platelets gradually continue their matrix formation over the rest of the titanium screw’s surface, leading to the process’ third step. 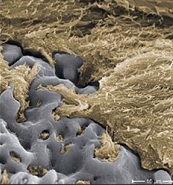 3) Once the platelets have been interconnected by the fibrin matrices, osteocytes, or bone-forming cells, appear and start coating the surface of the titanium. These form a strong, durable bone structure around the screw, firmly settling it into place. Finally, the dental implant has the structural and functional support it needs to be as a replacement for the missing natural tooth. Whilst all dental implants are composed of titanium (a few exceptions exist, though, in that some dental implants use zirconium as an alternative material), the grade of the implant depends on the surface treatment the implant received. Implants differ from each other in the surface treatment they have undergone. In research labs, dental researchers have implemented different levels of roughness on the implant surfaces that make the bone cells grow faster around them. What Happens When Osseointegration Does Not Occur? There exists a small chance that a dental implant will be “rejected” or will fail to integrate itself with the jawbone. This is a result of non-osseointegration taking place– fibrous tissue grows instead of the standard bone tissue forming around the titanium. This fibrous tissue is soft and makes the titanium screw loose, making it unable to support any structure that a dental surgeon places on top of it. In this case, the dental surgeon will wait for the bone to regenerate, after which he or she can insert the implant without trouble. Once again, this is a small but unlikely risk with all titanium dental implants. Titanium implant placement success rates rank high in the upper 90th percentile, making the majority of implant procedures a smooth experience. Brighton Implant Clinic is an award-winning UK dental implants centre, with three branches in Brighton, Hailsham, and Hove. The centre is founded on the principles of “care, compassion, and credibility”. The centre’s dental team has placed tens of thousands of dental implants successfully since its founding in 2009. Please Contact Brighton Implant Clinic for more information and to schedule a free initial consultation.